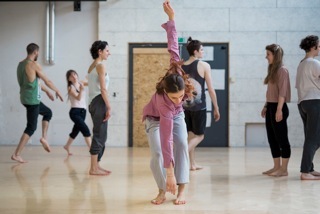 The Bachelor in Contemporary Dance offered by Manufacture – University of Performing Arts of Western Switzerland – in collaboration with Zurich University of the Arts (ZHdK) is the first university-level programme in contemporary dance in Switzerland. Practice-oriented, the programme directed by Thomas Hauert features partnerships with leading international institutions. Giving the students the opportunity to become familiar with numerous choreographic languages; meet renowned professionals in dance education and practice, and become part of a national and international network. The full-time programme alternates between basic regular classes devoted to practice and theory, and thematic workshops supervised by well-known professional artists. It favours experimentation in a holistic approach to the body and the world. The training rather explores the body’s infinite possibilities of movement and its ability to learn, develop and integrate new capacities, more than teaches historical dance styles and techniques or artistic trends. It seeks to coach creative, versatile and independent dancers, with a reflexive approach, able to contribute to the choreographic process. -the reflexive approach, where the theoretical input allows to put the artistic practice critically and constructively into perspective. It encompasses eight complementary modules: Dance Technique/Training, Creative Development, Theory and Body Studies, Artistic Practice, Interdisciplinarity and School-to-work Transfer.